My handwriting has changed. It’s spikier. Bolder, with shakes and quivers in places it used to swoop. Strong. But I don’t examine that so much as the edges of what these papers mean, for writing and for personhood. Lately, I’ve been spending most of my days and nearly all of my nights with my wrists tightly braced. Because when I don’t, my hands shake and seize. My fingers tingle, then lose feeling entirely. Daggers shoot up my arm. Because there’s pain in writing. Because I need to protect myself from it. The first doctor I saw thought it was carpal tunnel syndrome, although he admitted it was rare to see it in both hands. Unilateral: a new term I added to my lexicon. New experiences lend new words. New words enrich us, or limit us. Depending on the word. Knowledge, it seems, isn’t always power, after all. But to type less is to write less. To live, I need to write. The choice, in my mind, wasn’t one. Medical tests feel like science fiction. Every time I have one, I think there must be a less barbaric way to do it. White, coffin-like tubes that scream, prophetic. Radioactive waves that require metal vests. When the technician hides behind a solid wall from the machine she’s encased me in, something more skeptical than my body protests but because I am societally conditioned to need answers, I sign the line that releases them from liability and step inside the death machines. Modern medicine often doesn’t look like it’s come so far from the middle ages, from this side of the exam table, but those who question what we do or do not need often end up with more questions than solutions. Little vials of “modern medicine” designed to keep us placebo-silent. I braced myself for each result, braced myself for the answers that weren’t and braced myself against the assault of a world whose definition of normative hasn’t changed since man first crawled out of the ocean onto a land he emerged determined to conquer. I braced myself for the interactions that would change because I had changed, because even though we’re constantly changing, none of us are ever prepared for it and none of us know how to react. I braced myself for you, I mean. For all of you and the words no amount of aluminum and Velcro could protect me from. For me, I mean. As well. When I first started bracing against the assaults my occupation places upon this uncharted territory we call our bodies, something became immediately clear: people are cruel, and clumsy. I’ve always known this, I think, in an objective sense. We know humans are predestined to say things they don’t mean, or worse, say what they do and think that means they don’t have to apologize because it’s “true.” Truth isn’t always right. People shy away or act out in the face of what they don’t understand. We haven’t evolved so much, after all. 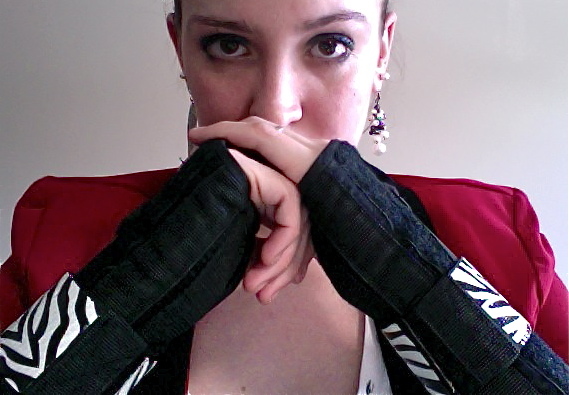 “Are those for carpal tunnel?” A fellow writer asked me the other night, her face a mask of barely-concealed horror. “No, no,” I answered, simultaneously questioning my own instinct to reassure her. We feel compelled to make each other comfortable in the face of our own perceived iniquities because what our Western society values, perhaps above all things, is comfort. My instinct was to tell her that her sense of doom is hyperbolic, but perhaps her doom isn’t. Perhaps all of this stems from assuming others are like ourselves, from injecting our own expectations of normalcy into the unique frames we pretend we understand how to inhabit. My mother was in a car accident when I was a child, in which her Volvo slid underneath a semi truck and came to rest, crushed “like a pop can,” she later told me, in the parking lot of a local diner. The proprietress ran out, wiping her grease-stained hands on her skirt. She didn’t ask if my mother was hurt until her own relief was aired. My mother, like me, felt compelled to reassure her. Her survival, it seems, served a purpose outside of her. We are all martyrs to our own particular causes, most not of our own choosing. What are we bracing from? Interactions like these hurt me, and I think I know why. Why acknowledgement of, for example, my red hair or my left handedness, or my exceedingly average height or any other minutiae that can also be observed and commented on with varying motivations or lack of motivations in the positive, negative or chemical, does not garner such a visceral reaction. I recoil at acknowledgment of my weakness because it suggests dominance in the inciting creature. I brace myself against the recognition of subjugation. Societal, cultural, biological or otherwise. We protect our softer edges from others’ sharpness. The edges rarely line up. We are creatures, after all. Our biology won’t let us forget that. And creatures are always snarling at one another with a desperate need to assert themselves. We fight mostly with keyboards now, but we don’t bleed any less red.